5 foot 4 inches tall and weighs 195 pounds. 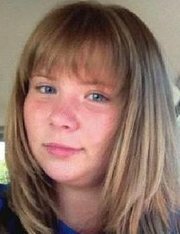 She has blue eyes, freckles and sun-streaked brown hair, and she was wearing a black shirt, gray leggings and a royal blue Aeropostale sweatshirt when she was last seen. She was also carrying a black and turquoise backpack. UPDATE I: Daria “Dasha” Clarke: Missing high school freshman found safe, reunited with family.